According to Medicinet (a part of WebMD), gephyrophobia is relatively common although few sufferers know the precise term. In layman’s terms, gephyrophobia is an irrational fear of bridges. While we do not intend to make light of a real psychological condition, a recent report on bridge safety in the Bay Area and nationwide has our San Francisco bridge accident lawyer wondering whether fear of bridges is always so irrational. Earlier this year, NBC Bay Area’s Investigative Unit (“the Unit”) looked into the state of area bridges and, as discussed in an updated article published this week, the news station’s concerns are now being echoed in a report from the U.S. Government Accountability Office (“GAO”). In April, the Unit found that 472 of the nearly 4,000 bridges in the Bay Area were rated “structurally deficient” by expert engineers, meaning some part of the core structure needs either repair or replacement. Although NBC reports that this number has improved a bit to 405 based on the GAO’s latest numbers, a disturbing 10% of the bridges in the nine county region remain in need of important work. Another 17% of the region’s bridges are functionally obsolete. Notably, functionally obsolete means the bridge is no longer adequate for its purpose but it does not mean the bridge is out of service or that there is a specific defect. As USA Today reported, the bridge that collapsed on I-10 in Southern California back in July had been labeled functionally obsolete in a 2014 National Bridge Inventory. On Tuesday, as NBC’s update explains, the GAO released a report (summary and full report available on the agency’s website) on the state of bridges and highways nationwide. Although the agency found that the state of bridges is improving with a drop in the number of deficient bridges and repairs performed on some spans, the report indicates there are still safety concerns. The GAO reports that 10% of the nation’s 611,000 some bridges are structurally deficient, a number that mirrors the local statistic, while 14% are functionally obsolete. In response to the report, NBC says that, for the first time in almost 10 years, Congressional leaders from both parties announced support for a 5-year fully paid plan to devote $305 billion to the upkeep and improvement of our nation’s bridges, roads, and railways. 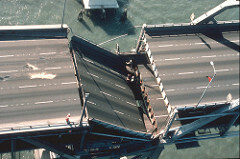 Notably, many bridge collapses involve a combination of factors. Bridge collapses are relatively rare but they can be terribly tragic. Legally, bridge collapses can be quite complex and require a lawyer who understands issues including product liability, negligence, sovereign immunity, and construction law. At the Brod Law Firm, we can provide this expertise to our clients as their San Francisco and Oakland bridge collapse law firm for the injured and the grieving. We hope that most bridge fears are indeed irrational and that those suffering a true phobia obtain the help they may need. If tragedy does strike, we are here to help.